December 6-16 LES and Clipper Train now boarding at the GL's platform! Thanks for starting a thread. It's time the lower lakes snow belts get in on the action this season. Here's to hoping we can both score some snow from the Fri/Sat system! 18z GFS suggest 1-2" for MBY, maybe 3" if your lucky west of LM??? I def think those streamers are going to give you guys in the LES belts of MI some pounding bands. I'm hopeful that these Clippers that look so dry on the globals will in reality be a bit better when we get in the shorter range. I've seen the true LES gurus say not to waste your time with a global for accurate portrayals. Also be nice for yby and others on the far side to get a bump in totals. Good luck with the potential clippers! I’m hopping on a plane in the morning and flying to Ireland for 6 days. Hope some of you can get a taste of winter in the next week. conditions, especially during the Thursday morning commute. Travel conditions locally worse under stronger bands of snow. * WHERE...Southwest Lower Michigan west of US-131. * WHEN...Heaviest snow occurs Thursday morning. Safe travels! Enjoy having a beer or two while your out there. I know 'em Irish folks like to drink so if you have time to kick back in a tavern somewhere with them folks....enjoy! 00z Euro came back with a decent chance of our first accumulating snowfall of the season for most of N IL/WI and Michiana region. I'll take it and run! Perhaps 1-3 or 2-4" amounts could be possible w this clipper type system for SEMI. The further SE movement, the, better for my area. We will see how this thing unfolds. The chance for snow exists though for this weekend, indeed. Great maps Tom! As expected, some ticks upward with moisture, even on the globals so very positive signs with this. Most guidance tossing up 3-ish inches for Marshall, but I think half is from this 1st LES round. Should look festive, and even back across IL does ok for mood flakes to a coating. This clipper has potential. Things just have to fall in place at the right time and there ya go, BOOOMMM. Several inches of accumulations could happen. Time will tell. Chicago has great potential also w this one, especially if it dives further SE towards the Indiana/Ohio Valley path. 12z NAM looking better and a bit more SW with its track and more moisture esp in MI...fluff up these totals a bit more with better snow ratios. "The first widespread accumulating snow this season is expected to occur this afternoon through Thursday evening. Bands of lake effect snow will first develop over northern Michigan, then spread southward through the afternoon and evening. A weak trough of low pressure will then enhance snow late tonight and early Thursday. Snow could become moderate in intensity, or even briefly heavy. This may cause significant reductions to visibility and quick accumulations on roads and walkways, making them slippery." Not bad. Gettin better each run. Lets continue this trend. That map clearly has my area in the 3-6" range, especially, in the Detroit area itself. Heck ya, 12z GFS looks like the Euro/Control and coming in stronger! That's going to be a sweet looking LES Plume for IN/MI! I'll take that in a heartbeat and run. Looking like a 3-6inch snowfall. Snow ratios might be high as well, which, would enhance snowfall numbers. 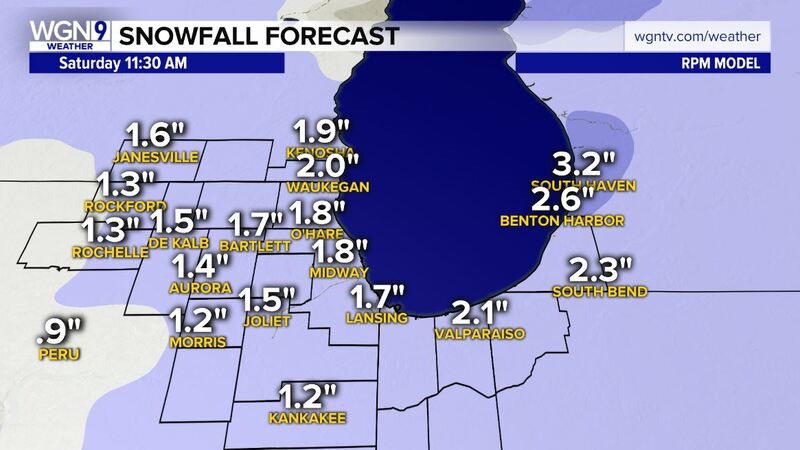 Looking like Chicago and associated areas are gonna get enough to whiten up the grass. Trough hangs around long enough that melting shouldn't be a huge issue. Models have us getting some flakes as well, but nothing really that measurable. It has great potential. It just needs to track SE towards the IN/Ohio border. I'm going to be in Northeast Iowa this weekend, so I just need this to shift about 50 miles further west to clip me with an inch or so of snow. Wisconsin looks like they will do well Friday night into Saturday. Still hope to see a small shift west. I'd be happy with even a 1/2" of snow to whiten things up. A few days ago, it had a stronger clipper that dove straight north/south, then lost it and tracked farther NE of here, but since has trended back the other way. Good signs among the NAM/GFS camp, now lets see if the Euro holds on. That could really fluff up in Michigan. Hopefully things keep trending in the right direction. No doubt! 12z Euro has 3 systems to track over the next 6-7 days. Also, they are trending stronger and more interesting each day we get closer. Razor sharp cut-off on the 12z Euro regarding placement of the thermal boundary and precip. 12z Euro trends are wetter over the next week. Someone could score 4-6" in IA/MN/WI/IL outta this pattern. MI is going to be ground zero and should be fully under a nice snow pack going forward. This model clearly paints 6inches IMBY! I'd take that verbatim. 2-4" over the next week is better than 0"! Absolutely, in this highly amplified north/south pattern, anyone of these clippers can lay down a decent snowfall. Question is, on which side of the playing field will you be??? 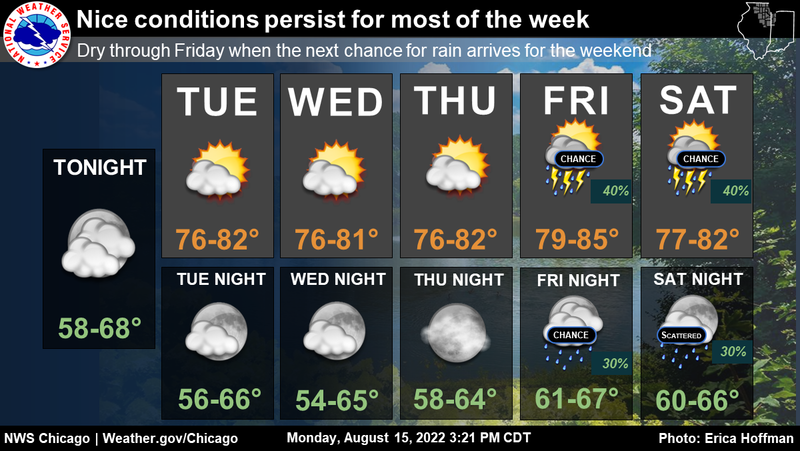 It is looking like IA will be the battle ground until about the 15th of the month when the pattern flattens out a bit. I'm sure E IA scores some snow out of this pattern over the next week. Noaa on board w potential decent snowfall during Saturday and into Saturday night (3-5"latest thinking). Ofc, w all the cold weather staying around, whatever snow does fall aint going anywhere anytime soon. This is a double edged sword. This highly amplified pattern can also shear off and destroy these relatively fragiile clippers, leading to more disorganized and dryer systems. Although, as you said, they can sometimes feed off of the baroclinic zone on the west side of the trough as energy, still don't wanna fall for the bait just to have it yanked away from us, a la this week. That run of the Euro was disappointing for this weekend for me. The 00z run looked more promising for far NE Iowa, the 12z run misses Iowa altogether. these types of clippers always seem to over perform as well as long as they have any moisture to work with. Usually can get some quick fluffy snow. if trends continue I'll be most of WI and N IL get 1-3" with maybe even isolated higher. I'm praying we get 1" in far NE Iowa at my parents house, the kids would be very happy to see any snow. GFS is very active with disturbances every other day next week near the GL’s. Fun times ahead. Except they all miss Iowa , except for that real nice one.... at hour 210. Although DVN mentioned in their AFD recently that its quite likely this clippers will bounce around a bit due to their low amplitude signature. Maybe one or 2 will bounce southwest and we get lucky? They're only missing by 75-80miles verbatim. They're coming here instead. I'll bet you on that. Loser gets my cat. Ya, it's going to bounce around but that is to be expected. The GEFS have been trending wetter so its encouraging to see the 00z GFS come in wetter in the 5-10 day period. I'm thinking the 00z GEFS continue the wetter trend. Now, if the 00z Euro shows something similar maybe we'll be onto something. Regarding the Day 9-10 system, it's lining up to something the 12z Euro was "trying" to show when I posted the jet structure maps in our Dec Observation thread. That system could become a hybrid. MI is going to be building a glacier next week...LES belts gonna crank! Models are coming in more moist for Saturday. A storm on the EC might slow down this clipper and throw down some more accumulations in MI. Something to keep an eye on. Could be higher snow totals than currently anticipated. Michiana is going to get pounded!